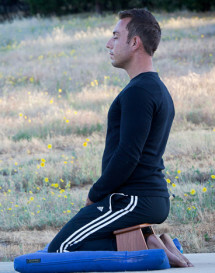 The proper position on a meditation bench. One of the most important aspects of meditation is to be able to sit comfortably while maintaining a proper meditation posture. Your back needs to be straight, and the body relaxed. You can sit in a chair, on a meditation bench, or a pillow on the floor. Here are some options. Sit away from the back of the chair, with feet flat on the floor. If your feet can’t touch the floor, get a shorter chair, or place a cushion under your feet to raise them. You want your thighs to be parallel to the floor. The correct way to meditate in a chair. Do not lean against the back of the chair. This will tend to contract your chest. The idea is to sit with an upright, un-supported spine, and your chest expanded. However, if you are not used to sitting this way, or if you have weak neck/back muscles or injuries, there are ways to overcome this challenge. Get a firm pillow and put it between your lower back and the back of the chair. This will support the lumbar section of the spine, helping to maintain its natural curvature. You can also place a pillow in the seat of the chair to cushion it. How to meditate comfortably on the floor. Begin with short meditations, gradually increasing their time. This will allow your back muscles to strengthen over time. Energization Excercises and yoga postures can also help strengthen your back muscles with regular practice. 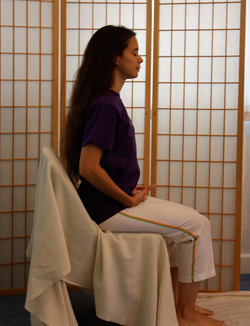 Meditation benches are a wonderful invention for making the legs comfortable and keeping the spine upright. You can also try sitting cross-legged on a pillow. Crescent-shaped or round meditation cushions are designed to help with this position. When one position becomes tiresome, calmly switch to another. Eventually you’ll find the best one for your body type. Remember, everybody’s body is different. It is recommended to insulate yourself during meditation from the subtle earth currents with a wool rug, wool blanket, or a piece of silk. Your meditation place should be a little on the cool side, with a source of fresh air if possible. A stuffy room will make you sleepy. Feel free to to wrap yourself in a wool or silk meditation shawl to stay warm, awake and aware!